Avon cleverly incorporates many things straight from Shakespeare, like the blood on your hands, the three witches, daggers etc. ; however, it is not necessary to know anything about Shakespeare to be able to enjoy the game. 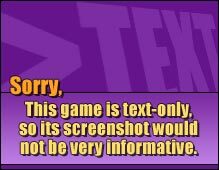 What *is* necessary, though, is that you have a pretty good grasp of how text adventures (or Interactive Fiction) works, since the puzzles are very difficult. The DOS version has a built-in hint system, however, that may help you a bit, and you can get a full walkthrough below. One thing that might turn off IF aficionados is that there is no "EXAMINE" command, but one gets used to it very quickly. All in all, Avon is a very enjoyable game; if you know the most important of Shakespeare's plays, the enjoyment is furthered by all the references Jonathan Partington has included.